One day I was standing in line at Walgreens and sitting right there by the register was this adorable hat. It was shaped like a top hat, the hat portion being the chimney, and Santa’s legs were sticking out of the top. The hat was musical and cute and whimsical. 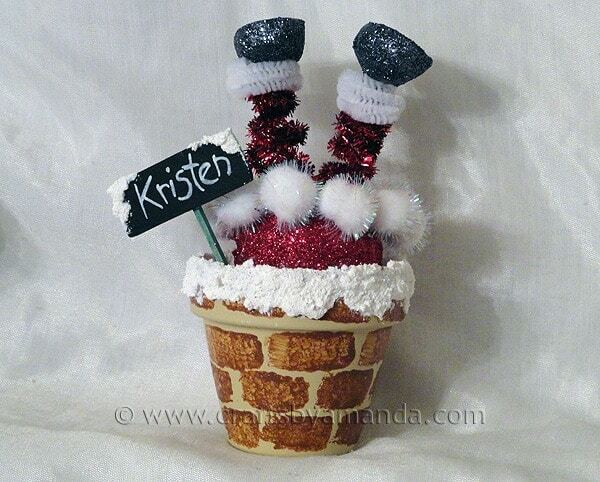 That immediately made me think what a cute Christmas craft that would make! 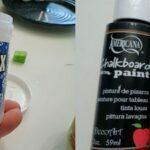 For this project I used Sno-Tex snow texture paint, Chalkboard paint, and Patio Paint. Man I love this Patio Paint! Have you ever used this? This was my first time and the coverage on this pot is amazing. I’ve painted a LOT of clay pots in my time and after this will never use regular acrylic paint again. Ev-er. First you’ll paint the clay pot. To make the bricks, just use a small rectangle cut from a household sponge. Then put a layer of Snotex around the rim. To make the legs you’ll twist chenille together to make it a fatter piece, then twist them around a pencil or paint brush to coil them. The full instructions are below, hope you have fun! 1 small wood rectangle cardboard will work too! Cut white chenille stem in half. 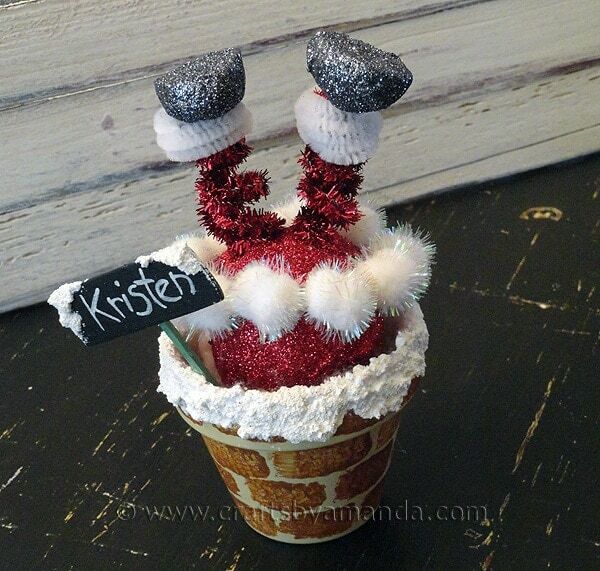 Carefully twist around Santa’s legs to create pant cuffs. Secure with glue. 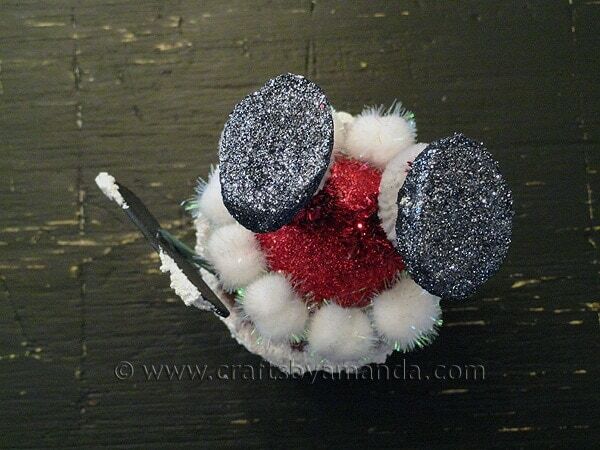 Insert the chenille legs into the red glitter egg (Santa’s bottom) and secure with white glue. You can create small holes in the egg first by poking a pencil into it, then inserting the chenille. Amanda…i made these a few years ago and left the name plates blank, i sold them at a craft fair and the fact that they could be personalized on the spot was a GREAT selling feature. Needless to say, they sold really well and fast, and HECK they were a BLAST to make too…GLAD i found your page, will watch for MORE ideas. Cheers, and thanks for sharing your creativity. Oh that is SO FUN! Thanks so much for sharing that story Marianne! I LOVE LOVE LOVE It.It is so cute & adorable.Thank You sooooooooo much.I might not get to it this Christmas…but it will be on my good list for next year.THANK YOU!!!!!!!! 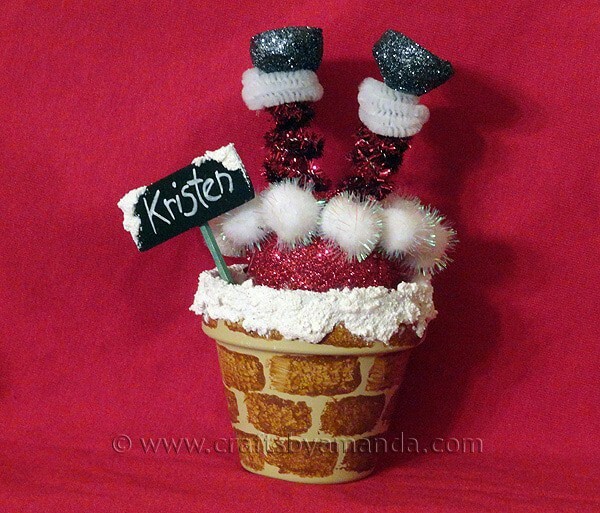 Love your “pots” and “bulbs” ideas..I’m also fan of pot ideas, just finished Vampires and bats with pots..love the Santa chimney idea..keep it up!!! !